Using innovative water-based technology, Liquitex Professional Spray Paint has the unique benefit of being low odor and does not carry the skin or eye irritant warnings associated with other spray paints. For further information see the FAQs section. Liquitex Professional Spray Paint provides the same vibrancy, permanence and performance that Liquitex is known for, while delivering the high coverage and opacity demanded of spray paint. Liquitex Professional Spray Paint is rated to lightfastness I or II* and is formulated using the same artist grade pigments found in other Liquitex Professional ranges. Unique water-based technology provides the ability to clean up with water when wet but is permanent and weather-proof when dry making it ideal for interior and exterior use.Versatile enough for almost any substrate, Liquitex Professional Spray Paint is suitable for use on canvas, wood, masonry and even glass. 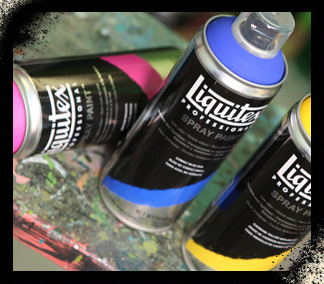 Liquitex Professional Spray Paint can be used on its own and with other Liquitex ranges including acrylics, mediums and varnishes for maximum versatility. Experiment working wet on wet with Liquitex Heavy Body and Soft Body, or use Liquitex Professional Spray Paint as a foundation for your artwork. Create a variety of effects using Liquitex mediums and ensure the artwork will stand the test of time by using a Liquitex Varnish to finish. With an extensive spectrum of 100 colors including transparents, iridescents and fluorescents, Liquitex Professional Spray Paint is formulated using artist grade pigments to ensure the cleanest and most brilliant colors possible. 50 colors are matched to the core Liquitex Heavy Body and Soft Body colors with additional hues added for a comprehensive color system. Unlike traditional acrylic paint, which can be mixed on a palette to achieve a desired shade, sprays are usually applied directly onto surfaces so black and white have been added to selected Liquitex colors to create a complete tonal range. The scale on the back of each can identifies the composition of each color within this spectrum. Very cheap bulk or single item art supplies and custom picture framing. Custom stretched canvas and jersey framing, Chicago Custom Picture Framer, Canvas Stretching, Wholesale Art Supplies, Chicago Art Supply Store, Art Supplies in Chicago, Art Supplies Store, Chicago custom picture framer, Cheap canvas, Art Supplies Canvas, custom picture framing in Chicago, Cheap Art Supplies, Art Supplies for Children, Air Brush, Cheap Easels, Mat Cutter, Art Supplies Oil Paints, Acrylic Paint Set, Oil Paint Supplies, Affordable Art Supplies in Chicago, Opaque Projectors, and Custom Picture Framing sum up our services.